We are studying logarithms in College Algebra. We began with fact families. Many reps; some started with the exponential fact, some with the log fact, some with the root fact. We expressed our heights as logarithms, base 10, of our heights in inches, and we brought a tall and a short student to the front of the classroom to stand next to each other. Given the log height of the tall student, we predicted the log height of the short one and were surprised to find that the difference was less than one-tenth of a log-unit (whatever that is). 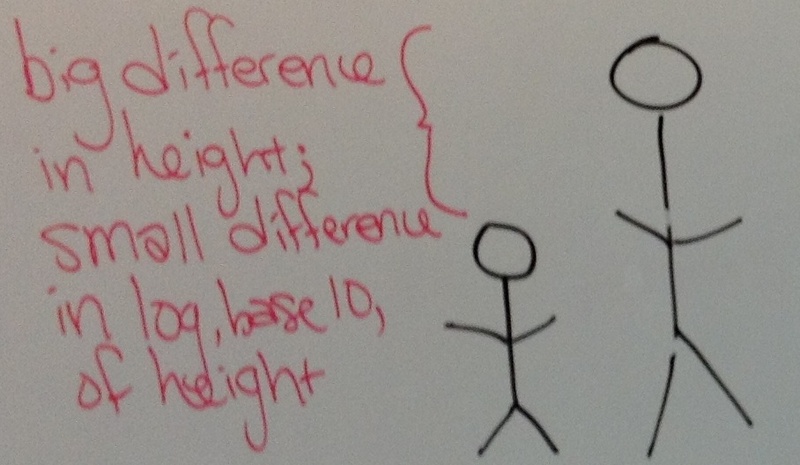 We came to terms with this difference by noticing that the tall student, while much taller than the short student, was not exponentially taller. The tall student wasn’t even twice as tall-never mind ten times as tall. I gave the definition of pH as the negative log of the hydrogen ion concentration. We considered the consequences of this goofy definition, and what it says about possible values on the pH scale. We puzzled over why pH stops at 14, when there should be no theoretical limit on the upper value of a negative logarithm of a positive ratio, and we wondered why 7 is considered neutral. Finally, I asked them to predict the pH of a 50/50 mixture of water and orange juice concentrate. Nearly all of them averaged the two pH values (of course), getting 5.7 or some adjusted value nearby. We watched that video and saw that the result is nearly indistinguishable from the original pH of the orange juice concentrate. But someone noticed that the difference of roughly 3 in the pH values means that the hydrogen ion concentration is 10,000 times as much in the orange juice concentrate as it is in the water. Just like our tall and short students had a big difference in height, but small difference in log heights, our two substances must have an enormous difference in hydrogen ion concentration to account for the sizable difference in pH values. And any other way you want to introduce e (and mathematicians’ fascination with it) is going to rely even more heavily on Calculus. But half-lives are a nice, tidy application of an important set of College Algebra topics: exponential and logarithmic relationships. So I give an extended assignment that deals with half-lives. And I encourage students to think in terms of an annual decay factor, which we can find by means of extracting roots. We know that it takes thirty years before the decay factor gets down to 1/2, so we need to know what number to the 30th power is equal to 1/2. And in reading their work, I have been blown away by the number of students who have done the whole assignment in terms of half-lives. They are thinking explicitly in terms of half-lives. Rather than blindly plug numbers into , they are figuring out how many half-lives there are and then using that number to calculate. So they’re using the equation, , where x represents the number of half-lives that have passed. They are putting appropriate scales on their axes, labeling the x-axis half lives. And one even made the observation that, with this setup, the graph describes all half-life situations; the only difference is the length of the half-life. What if we spoke about division as we do logarithms? When we read this notation aloud, we say (for the second example), The quotient, factor 5, of 10 is 2.
we ask ourselves, What factor goes with 3 to make 12? 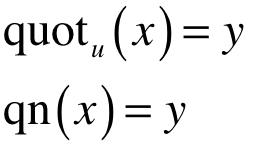 The following properties of quotient are derived from corresponding properties of multiplication. There are some important laws pertaining to the quotient. The next section will include algebraic proofs of these laws. These properties will be important when solving equations involving quotients. One other convention for the factor 10 quotient is this: If a factor is not indicated, we assume the quotient is factor 10. 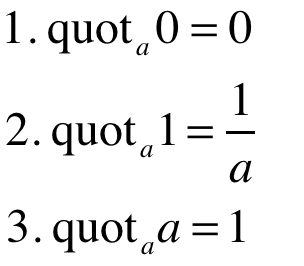 More commonly, we capitalize the Q in Quot in order to indicate the factor 10 quotient but either notation is accepted. Many times, we will be able to find a quotient by inspection and use of the associated known multiplication facts. In almost all cases involving relatively small numbers, we can approximate the value of a quotient by use of multiplication facts. When we require a greater level of precision, we will need the change of factor formula. The quotient function appears so often in computations that some important measures are defined in terms of it. Of these, perhaps the most important is speed. I set this up and critiqued it in this blog before teaching it. The basic idea is that I needed a way into logarithms with my College Algebra students. I have two question videos. I debated which to use in class and ultimately chose the first option below. In this option, we measure the pH of water and the pH of pure orange juice concentrate. 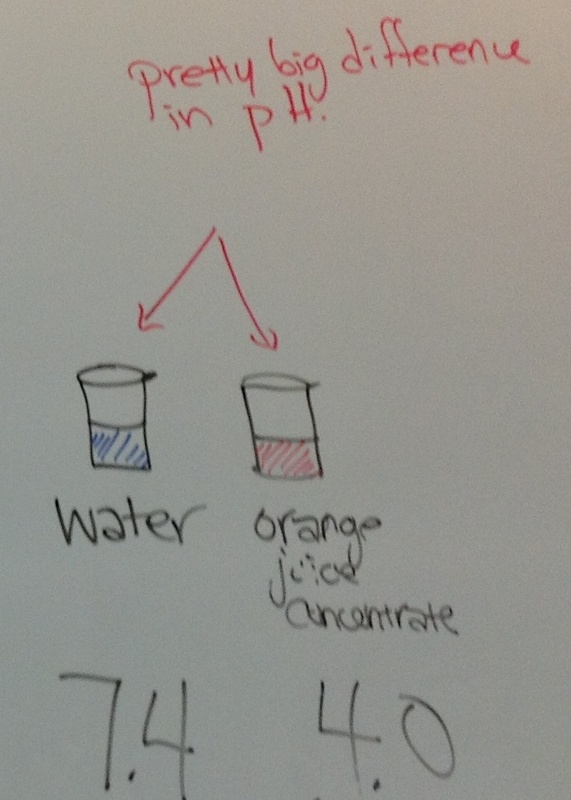 In this option, we measure the pH of water and the pH of 100 ml of water mixed with 1 ml of orange juice concentrate. In fact, this last question is the one that motivated this project. I was expecting (as will my students) that the difference between the pH of juice and the pH of concentrate will be quite large. This actually doesn’t demonstrate juice (see post where I regret this oversight in my data collection). But it’s pretty close. Real OJ should be 3:1 water to concentrate. This is 5:1. I lamented the other day that I didn’t capture a question I was sure students would ask about my pH videos. And today they didn’t ask it. But they asked other stuff I had not anticipated. How are logarithms used in the calculations of pH? What is the concentration of hydrogen ions in the orange juice concentrate? How does the mixing of pH work? Does 1 unit of pH 1 mixed with 1 unit of pH 2 give us 2 units of pH 1.5? Two of these questions were from students who have come to office hours many times, but who have never piped up with a question or answer in a whole class session. They are always engaged and on task, but never vocal. 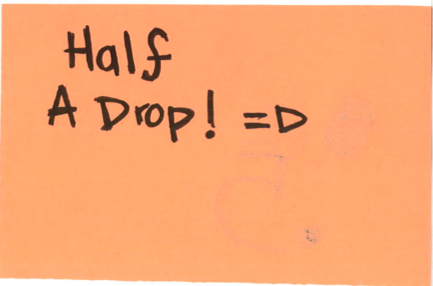 In pairs, students wrote their answers on slips of paper I had provided, then held them up all at once. Their guesses ranged from 3 ml to 300 ml. The median was approximately 7 ml. We watched the 10 ml answer video and I asked whether anyone wanted to change their guess. They all did. We watched the 1 ml answer video. And students revised their guesses again. Then I restated the definition of pH and demonstrated solving for the hydrogen ion concentration in the orange juice concentrate (question 3, recall). On Friday, we’ll do some pH computations to verify/approximate the experimental results. On the way out of class, a student left her final guess on my desk.